What prevents you from finding a job? The fear that there are more professional candidates? The belief you have to pull strings? Fortunately, these are all myths. 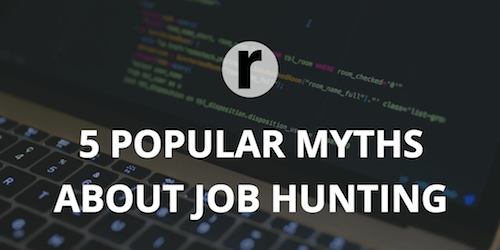 Resumance decided to debunk the 5 most common misconceptions about job search which often prevent people from achieving success. Myth #1. The work is received by the most qualified candidate. activity and willingness to work for results. So, in an interview, you shouldn't be overly confident in yourself, if you feel you're the most qualified candidate. At the same time, don't worry if you know that your skills and experience may not be enough. Better make every effort to show yourself to a potential employer for 100%. Myth #2. Having reduced the salary requirements, you can more likely get a job. Often applicants think that by lowering the salary request, they will become the most attractive candidates. However, it is not. Opening a vacancy, the company doesn't think about how to save money. The employer is looking for a professional who will best cope with the job. While your salary requirements remain within the average figures on the market, the employer will choose between you and the other candidates for professional and personal qualities. If you greatly reduce the requirements, you'll demonstrate how desperately you're looking for a job, and the employer will have a suspicion that you are for some reason not in demand as an expert. Myth #3. One resume for all vacancies. Many applicants believe that it's enough to make a resume once and make updates from time to time. This is a great misconception. According to statistics, the employer spends no more than 20 seconds to view the resume, so it's necessary to grab his attention in the first seconds. Visual presentation of information is constantly changing, so the text written 5 years ago won't attract someone's attention. This doesn't mean that you need to rewrite your resume every year, but it's worth keeping an eye on trends and orienting yourself towards the actual approaches, for instance, making an infographic resume. In addition, it's not superfluous to adjust the resume - change the template, shift the emphasis depending on where you submit it. Many employers pay attention to how you adapted the CV specifically for their company, its requirements and style. Obviously, getting a job in an advertising agency and an international organization with the same version of the resume will be difficult. Myth #4. Employers do not hire unemployed people. Often people who quit or lose their jobs come to a stupor because of this myth. They think that you can find a job only when you occupy some position, and if you had to stay out of work, then it's not worth trying. But employers are also people and they understand perfectly well that in such a situation a person can be not through his own fault. You can be sure that if you show yourself as a strong candidate at an interview, the employer won't focus too much on why you're now sitting without work. However, it's better to clear up yourself what caused the dismissal and tell the employer how you used the period of unemployment with the benefit for your own development (for example, you attended profile courses, trainings, continued to monitor changes in your field). Myth #5. You have to pull strings to get a good job. This myth arose among those who thus try to justify their passivity. Every day thousands of offers from different companies appear on the job placement portals. About half of all employers themselves are looking for employees in the resume base even before the job placement. Indeed, through your friends you can find out about the vacancy, which the company hasn't yet posted on the Internet. However, more companies are practicing several stages of the interview. As a rule, at each stage of such a multi-level interview non-professional candidates are eliminated.